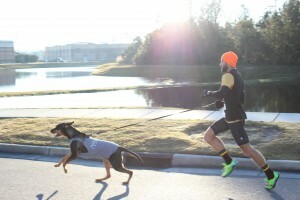 Canine 5K & 1 Mile Turtle Crawl – December 1, 2012 | NC Race Timing and Running Events | Go Time! Come run with your best canine friend or opt to run solo at the McColl & Associates, Inc.’s Canine 5k. This is a flat fast course around Mayfaire Town Center. There is a limit of one dog per person. The dog must be at least 6 months old, must be up to date on vaccinations, well-trained, well-behaved, and must be kept on the leash at all times. Leashes may not be longer than 6 feet and may not be a retractable leash. Please also avoid participating if your dog is in heat. Thank you! Proceeds benefit the Karma Foundation.